A denture is a removable replacement for missing teeth and surrounding tissues. Two types of dentures are available, the first one is called a complete denture and the second type is called a partial denture. Complete dentures are used when all the teeth are missing, while partial dentures are used when some natural teeth remain. First, an impression of your jaw is made using a special material. Next, the shade of your natural teeth will also be determined. The impression and shade are then given to the laboratory so a denture can be custom-made for your mouth. The dental lab makes a mold of your jaw, places the teeth in a wax base, and carves the wax to the exact form wanted in the finished denture. Usually, a temporary denture will be done at the dentist’s office so any adjustments can be done. First, the dentist will take an impression of the upper and lower arches of your mouth. At the next visit, the dentist will record the relationship of the arches that best resembles your original bite and help you select the shape and color of the denture teeth and gums. Keep in mind the color of everyone’s gums varies. In the subsequent visits, the dentist will adjust your bite, test your speech and check the appearance and functionality of the denture teeth and gums. For the first few weeks, a new denture may feel awkward or uncomfortable. However, your mouth will eventually become accustomed to wearing it. 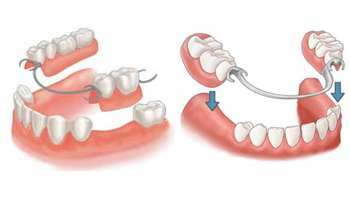 Inserting and removing the denture will require some practice. Never force the denture into position by biting down. This could bend or break the clasps. Start out by eating soft foods that are cut into small pieces. Chew on both sides of the mouth to keep even pressure on the denture. Avoid sticky or hard foods, including gum.